One of our favorite parts about working in Ukraine has been the enthusiasm of our volunteers. On August 25, I left Washington, DC, for Kyiv, Ukraine. Through a grant from the US State Department, the Lemelson Center has collaborated with Art Arsenale, one of Kyiv’s leading contemporary art museums, to bring Spark!Lab to Ukraine for the month of September. 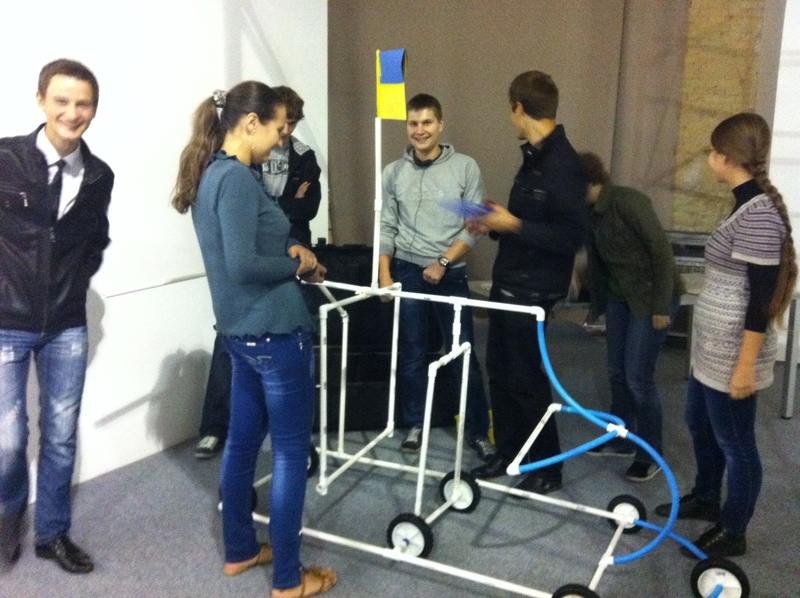 After an initial planning visit in October 2011, I had spent most of this year planning for Spark!Lab’s arrival in Kyiv. As I boarded my plane bound for Ukraine, I could hardly believe that our newest Spark!Lab outpost would be opening in a matter of weeks. I traveled to Ukraine with Steve Madewell, Spark!Lab’s Resident Eccentric. Steve and I spent our first week on the ground setting up the Spark!Lab space, which is housed in a huge, old building that was originally built as an arsenal. When we arrived in Kyiv, the 4,000 square-foot space had concrete floors, bare walls, no furniture, and a single flood light illuminating the interior, which was full of the various crates and boxes we had shipped to Kyiv in advance of our arrival. On that first day, it was hard to imagine that the space would become a vibrant hub of invention and creativity. But over the next week, the arsenal was transformed: carpet was installed, giant banners with the Spark!Lab logo and graphics were hung, lighting was added, and tables and stools were delivered. 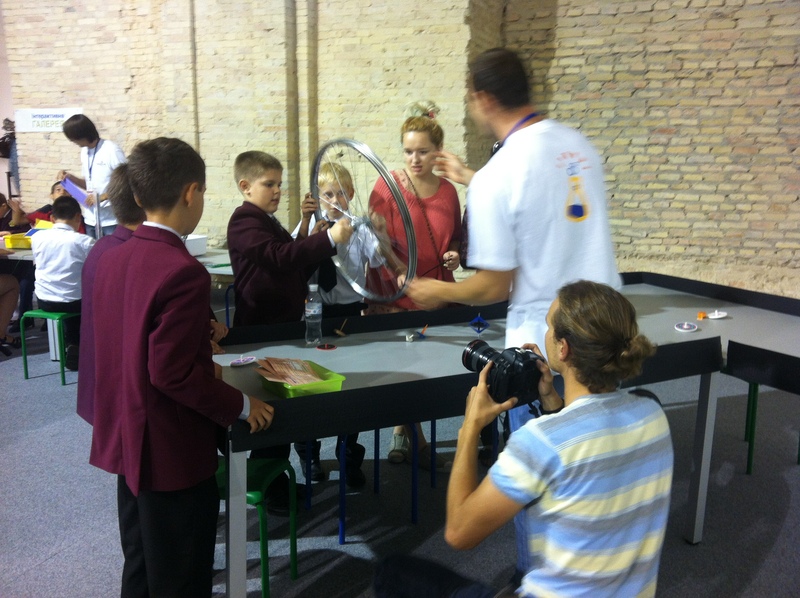 As we began unpacking our boxes and installing the activities we’d brought with us to Kyiv, Spark!Lab came to life. But what we needed were volunteers to facilitate the activities, engage visitors in the invention process, and help children to recognize their own inventive creativity. (We also needed visitors, of course, but we didn’t have many doubts that Spark!Lab would be a popular destination for kids, parents, students, and teachers from Kyiv and beyond!) Since June, Art Arsenale had been recruiting students from local universities to serve as volunteer facilitators. The majority of those who signed up were students at Kyiv Polytechnic Institute, one of Ukraine’s top universities and a chief collaborator with Art Arsenale on the Spark!Lab project. Though I was bolstered by the news that nearly 100 students would be attending our Spark!Lab training sessions, I greeted the first day of training with a bit of trepidation. Volunteerism is not a part of Ukrainian culture in the same way it is in the United States. Further, the idea of hands-on learning in a museum setting is just gaining popularity in Ukraine. Would the Spark!Lab philosophy and educational approach translate to a different culture? Would the students be interested in Spark!Lab? Would they stay excited and committed for the entire month that Spark!Lab would be open? The volunteers I met over the next four days of training quickly allayed my concerns. They were engaged, focused, enthusiastic, inquisitive—and, best of all, innovative. They were attentive at each step of the training and genuinely seemed to embrace the Spark!Lab philosophy: “Everyone is inventive.” As Steve and I trained them on each of the 10 activities, the students showed creativity not only in the inventions they created (we had them participate in each activity as if they were visitors), but also in the strategies they developed for engaging visitors who would come to Spark!Lab. They embraced the inquiry learning approach to which we introduced them, developed questions to engage children in the different activities, and even discussed ways to work with over-anxious parents and teachers! As we make our way through the last week of Spark!Lab here in Kyiv, the volunteers continue to impress me. They have shown up for each shift as expected, many of them working multiple shifts per week. But more than that, they have done an impressive job facilitating the activities and never seem to tire of encouraging inventive creativity in the more than 30,000 young people who have visited Spark!Lab since it opened on September 6. At times, the crowds of visitors have been daunting even for the most seasoned Spark!Lab facilitator, but each time I check in with the students to see how they’re doing, they smile and tell me they’re having fun. Many of them have told me they wish Spark!Lab had existed when they were children, and though they will be glad to have extra time in their schedules when we close, they will miss the energy and dynamism of the space. As Spark!Lab was filled with a near-capacity crowd last Saturday, one volunteer rushed up to me. I thought she needed supplies for her activity or, worse, that there had been an accident or emergency. Instead, she told me, “I never get tired of seeing the faces of the children when they realize they can invent. Their smiles make my heart sing!” And that makes my heart sing, as I realize that the spirit of Spark!Lab is not confined to our museum in Washington, DC, or even to our own country. Thanks in large part to the commitment and energy of our dedicated volunteers in Kyiv, Spark!Lab has crossed institutional, language, and cultural barriers, and continued the Lemelson Center’s important work to inspire inventive creativity in young people. Recent visiting colleagues toured hands-on spaces at the Smithsonian and learned the process of developing activities. While in Ukraine setting up Spark!Lab, we went shopping for supplies and got to really explore Kyiv. I made my first trip to Ukraine in October 2011. Three years later, I am marveling at the transformation of Art Arsenal.